We have spotted the gorgeous Pakistani wedding of Alina and Munaf to infuse your wedding Wednesday with charm! I Do Clicks stunningly captured our spotlight couple during their romantic outdoor portrait photo session and their luster Nikkah ceremony at the elegant facilities of The Ellora in Edison! 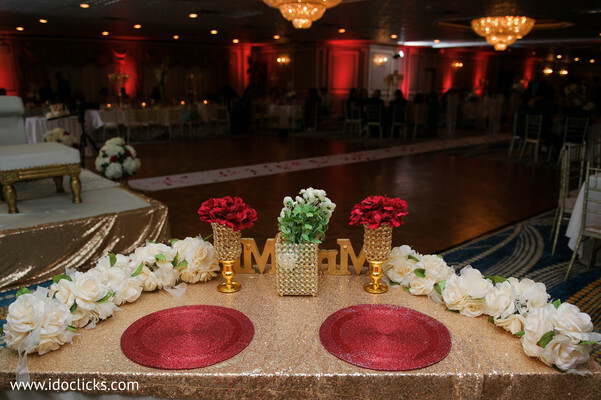 Guests arrived to witness the union at this exclusive spot, which was filled with rich red and gold decors and striking drapery! Alina dressed in a traditional Sharara pants suit, embellishments and full of sparkle shined as an absolute princess, plus the henna swirls and paisleys created for her by Mehndikalogie made the entire look as perfect as it can be! I’m also swooning over Raja Munaf’s dark slate blue Sherwani and his red turban which is as equally gorgeous. After their union, these lovebirds whisked off in the coolest way in a fabulous red convertible getaway car! Take a closer look at the full gallery for more fabulous moments! Catch up all the details of Alina and Munaf’s Walima coming up next!